Check out my fangame, Pokemon Uranium! It's been well a year since my last journal entry, but since I've been posting artwork again, I figured it was time to update you all with some words, too. First of all, some life stuff: I'm in grad school now. This definitely is taking up the majority of my time, but it's also something I love doing and I'm passionate about. Fortunately, I can still do pixel art and other artwork whenever I have free time. It's a great way to unwind after a stressful week of classes. Also, I wanted to address a persistent question that keeps coming up: no, I'm not doing any more work on Pokemon Uranium. The project is complete as far as I'm concerned. So, please don't send me bug reports or asking me where you can download the game or anything like that. Any new artwork I do (ie. fakemon sprites) won't be for Pokemon Uranium. Aotius and Mutios were the last sprites that I will make for the game. As for new projects... with school keeping me busy I'm not really looking to take on any new game projects at the moment. But I'm not ruling out the possibility entirely. One thing's for sure is that I won't be doing any more fan games... so please, please don't ask me if I'll sprite for yours. Since I'm back at school and money is a little tight at the moment, I'm reopening pixel art commissions so that I can get back in the groove of making art on a regular basis. These will be on a first-come, first-serve basis. I will open up a number of slots and close commissions when they are filled. I charge hourly based on how long it takes me to make a sprite. Larger sprites will take longer and thus be more expensive. I take PayPal. That's all for now! I hope to do some more Monster Hunter pixels and maybe some halloween-themed stuff. Hope you guys enjoy my art that's to come. I am a pixel artist specializing in Pokemon sprites and Fakemon designs. I have been spriting for more than 10 years. I will not join your fangame and make free sprites for you. My fakemon designs are not for your game project. I do however do Pixel Art commissions. If you are interested, you can check this journal for more information. Oct 13, 2018 Life Update + Commissions! Jul 2, 2016 Pokemon Uranium NEW Game Trailer + Release Date! Feb 1, 2016 Raptorch Plush! Dec 14, 2015 Where did Twitch go? Aug 14, 2015 New Blog Post, Podcast and HYPE!!! 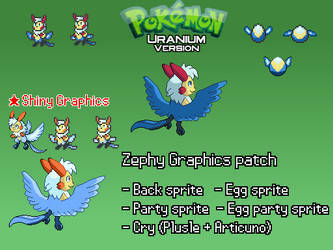 These sprites were made on commission and are not for use by anybody except the commissioner. Commission status is currently CLOSED but should open soon, watch my journal for details. Legendary #2 of the trio, and my personal favorite. I had a lot of fun designing and spriting this one with all its colors and details! The first of three Legendary Pokemon sprites done on commission For a tabletop RPG campaign! Little preview of what's to come Those of you who tuned in to my livestream know what's up. Welcome to the Galar Region! Do you choose Grookey , Scorbunny , or Sobble ? Grookey, Scorbunny & Sobble are (c) the Pokémon Company. A Pokemon spinoff game concept: Pokemon FossilI got this great idea called Pokemon Fossil. I'll split up the gameplay,plot into parts. HAPP-E B-DAY to the artist of my favorite fangame.